DD5LP/P – December 29th. 2015 – DL/EW-022 Herzogstand. I’ve had Herzogstand on my “to do” list for a while. It is a relatively easy climb and attracts a large number of walkers, so I expected that I would be limited on space to put up an antenna and so packed the loaded vertical and all other equipment into one rucksack. I was hoping to add it to my activated on 10m, summits list and hence receive another multiplier point for the current 10m/6m SOTA challenge. Herzogstand is a mountain above Walchensee in Southern Bavaria, access is via a cable car to the neighbouring mountain (Fahrenberg) from where it’s a ten minute walk to the Herzogstand Gasthaus (Restaurant) and then one takes the track along the side of Martinskopf mountain to the start of the serpentine track up to first the holy cross and then the pavilion on the very top of Herzogstand. Expected time from the restaurant to the summit is 45 minutes. My journey to the summit from getting in the cable car to arriving at the summit took me 40 minutes. It probably would have been five minutes quicker except for the number of other walkers on the (partly iced over) track up (I’m glad I took my spikes to add to my hiking boots! ), Once I reached the summit, after pausing and taking some photos at the cross, I saw an area next to the pavilion that had once been some kind of small building but all that remained were it’s foundations (about 6 foot by 4 foot). OK for me – I set up the tripod and loaded whip in one corner and ran the counterpoise wire out along the top of one pf the partially remaining walls. I did not add any extension to the top of the whip on this activation as I was restricted for space as to where I would run it and my main aim was for contacts on 10m where I don’t need the extension. Putting down my plastic painting sheet in the opposite corner of the fountations from where I had put the antenna up, I put the rig and logbook on it, took off my skiing jacket (it was warm on the summit in my sheltered position, but cold when one was in the wind) and got ready to start some SOTA action. I immediately started calling CQ SOTA on 10 metres on 28.370 after checking the frequency was clear. I then spotted myself but to no avail. After about 15 minutes, I decided it was better to activate the summit anyway, even if I could not get a 10m contact, so I adjusted the vertical antenna to 20m and called CQ there where I got a quick response from many of the usual chasers. Reports of my signal were not as good as usual which I put down to the antenna but I realised on my next activation, that the FT817 had been running at only 2.5w output on Herzogstand not the full 5w, so that would also have been a factor. After logging 10 contacts in 9 minutes on 20m, one being an S2S, I decided to give 10m a go again as I only intended to be on the summit 30 minutes due to having to be back home mid-afternoon. I was rewarded on this second try of 28MHz with 3 contacts with Austrian stations, one of them an S2S. 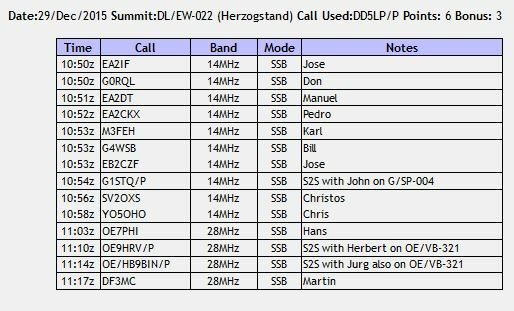 After I had already announced I was going QRT, I got a telephone call from Martin DF3MC who had activated Herzogstand the previous day, I called him on 10m and we made a QSO, meaning he had a completed summit within 24 hours. Some interest was shown by one of the walkers on the summit and after explaining what I was doing, he said that he used to be involved with CB and had done some portable operating with friends, years ago. He seemed interested possibly in Amateur radio and I gave him a DARC brochure with the necessary contact information, so that could be a new Ham at some time in the future. He also mentioned to me that Herzogstand used to have a very large LF antenna running down the mountain that was used in the 1920’s for long distance Radio Telegraphy. At the time, the only other equally sized antenna was in Indonesia and these two were the largest in the world. Later the antenna was used for research before being taken down. Shame! It would have been nice to see how such an antenna with 5w of Amateur radio power would have performed HI. After completion of the activation, packing up and the route back down was, thankfully uneventfull and I arrived home exactly on schedule. A nice day out. Definitely the correct decision to take the small pack and small antenna, with so many people (and dogs) on the summit and no where to safely set up away from the summit, had I taken the fibreglass pole and dipole, I would not have been on the air. Next time I should check more carefully that the rig is set to full power. Very glad I got the 4 10m contacts, for sometime there I thought I wasn’t going to. Very lucky with the weather at this time of year. This entry was posted in SOTA and tagged DL/EW-022, Herzogstand, SOTA by VK2JI DD5LP G8GLM. Bookmark the permalink.